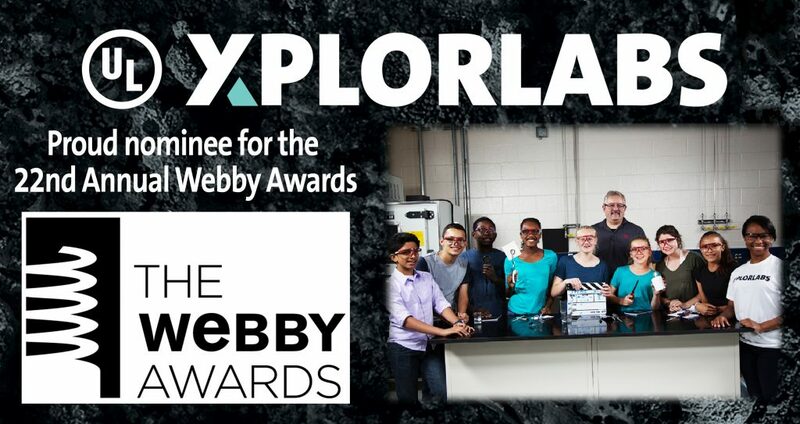 Xplorlabs’ Fire Forensics Module is Nominated for a Webby Award! It is with absolute joy that we bring you the best news we’ve heard thus far this year: UL Xplorlabs Module, Fire Forensics: Claims and Evidence, was officially nominated as a finalist for the 2018 Webby Awards in the category of Science Website. What are the Webby Awards? As the leading international award to honor excellence on the internet, the Webby is presented by the International Academy of Digital Arts and Sciences, which honors the best of the web in seven major categories: Websites, Film and Video, Advertising, Media and Public Relations, Social, Mobile Sites and Apps, Games, and Podcasts and Digital Audio. We are honored to be included among the list of prestigious nominees, and we want to do our best to bring this award home! We are asking all of our UL family, our friends, partners, and now YOU, to help us by voting for UL Xplorlabs for this award. All ballots are cast on the Webby Awards Nomination website, so check it out now and submit your vote! All votes are due by April 19th!